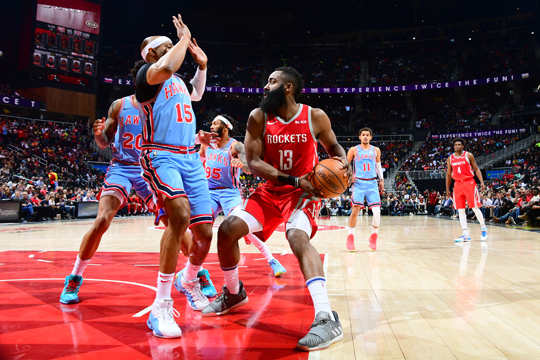 Los Angeles—Houston Rockets star James Harden carved a piece of NBA history on Tuesday after a 31-point haul against the Atlanta Hawks made him the first player to score at least 30 points against every team in the league in the same season. The 29-year-old reigning NBA MVP’s points milestone came in a dominant 121-105 road win over the Hawks. Atlanta’s scoring was led by Trae Young with 21 points, 12 assists and four rebounds. Houston’s win keeps them in third spot in the West, with 45 wins and 26 defeats. “When you’re having fun, you can get it going, especially at the end of a quarter,” Curry said later. Curry’s performance drew effusive praise from coach Steve Kerr. The architect of the comeback was Nets guard D’Angelo Russell, who delivered a 44-point display to fire the Nets. Twenty-seven of Russell’s points came in a remarkable fourth quarter, which ended with Rondae Hollis-Jefferson driving in the game-winner with just under six seconds remaining. The Bucks shrugged off Antetokounmpo’s absence to post a comfortable 115-101 victory as the Lakers already slim chance of reaching the playoffs grew even more remote.